By an unknown artist: Collage of Mahatma Gandhi and his associates during Salt Satyagraha, 1930. By an unknown artist: Drawing of Mahatma Gandhi blessing a child, c. 1930. By an unknown artist: Drawing of Mahatma Gandhi spinning in front of Bharat Mata, c. 1930. 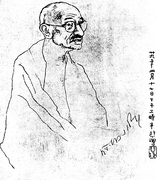 Drawing of Mahatma Gandhi by a Japanese Artist; carrying Gandhi’s signature, c. 1930. By an unknown artist: Drawing of Mahatma Gandhi, c. 1930. Drawing of Count Leo Tolstoy by his daughter which she presented to Gandhi when he visited Rome, December 1931. By an unknown artist: Jawaharlal Nehru and Subhas Chandra Bose, c. 1939. 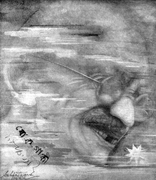 Painting of Mahatma Gandhi by Subho Tagore, 1940. Drawing of the samadhis of Kasturba Gandhi and Mahadev Desai at Aga Khan Palace, Poona, May 1944. Drawing by an unknown artist of Sardar Vallabhbhai Patel, c. 1945. Drawing by an unknown artist of a building at Sevagram Ashram, 24 November 1946. Drawing by an unknown artist of a building (Magan Nivas) at Sevagram Ashram, 24 November 1946.